Thursday Evening, December 6 – Sunday Noon, December 9. Extended option to December 11. Please join us for a rural retreat near Nashville at the Bethany Hills Retreat Center. In this retreat we will stabilize attention and deepen concentration through the breath and body, then gradually open our awareness to the boundless space of mind and heart. The retreat will include mindfulness, open awareness and compassion practices. These practices help us cultivate a quality of compassionate presence that embraces even our most difficult experiences with equanimity and insight. The practices also empower and support us in our challenging everyday lives. As we awaken from the illusion of separateness, we experience intimacy and interconnection with all things. 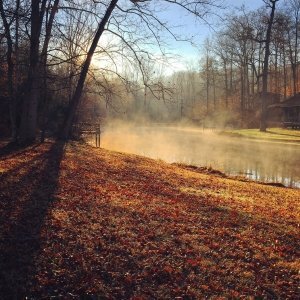 This silent retreat will include sitting and walking meditation, instruction, dharma talks and private meetings with the teacher. Retreat cost is $265 if paid by November 6; $290 after. The five night option is $425 if paid by November 7; $450 after. A $100 deposit holds your spot. Please indicate if you will be attending the three or five night option. The retreat fee covers lodging and all meals. The teacher is compensated separately through the practice of dana (generosity) from those who attend the retreat. There will be an opportunity at the retreat to make a generosity offering to the teacher. A scholarship spot is available if you need financial assistance. To join the waitlist, email onedharmaretreat@gmail.com. You can make your payment at the Paypal button below (paying the either the deposit or full amount) or by check, made out to One Dharma Nashville and mailed to One Dharma Nashville, P.O. Box 158533, Nashville, TN 37215. Lisa Ernst is a meditation teacher in the Thai Forest lineage of Ajahn Chah, Jack Kornfield and Trudy Goodman. She leads classes and retreats nationally. She is a visiting teacher at Spirit Rock meditation Center in Woodacre, CA.